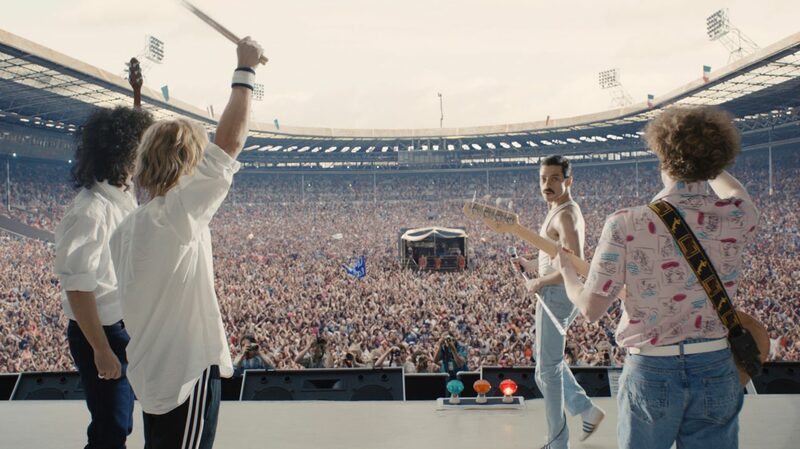 To the ordinary list of problems with the conventional biopic - they are boring, they are shallow, they are pandering, they are formulaic - Bohemian Rhapsody reminds us that they can be even worse still than the none-too-high standard. For on top of all its other shortcomings, Bohemian Rhapsody is something of an official, authorised biopic, one in which the three living members of the iconic British arena rock band Queen - Brian May, Roger Taylor, and John Deacon - have all signed off on a cinematic telling of the late Freddie Mercury that presents the most outrageously pro-May/Taylor/Deacon version that a film which actively finds all three of those men deeply uninteresting possibly could. It's no real surprise that a movie sold more or less as "watch Rami Malek lip-sync to all your favorite Queen hits"* functions first and above all as an advertisement for Queen as both a purveyor a huge hit songs, and also as something of a lifestyle choice for people who want to feel like one of the best-selling acts in the history of music is also some weirdo little underground thing catering to misfits and outcasts. A potential drinking game: every time one or another character says something to the effect of "but we're not a normal band, we're Queen", take a shot, and by the time Freddie is plunging into a chemically-fueled hedonistic hell where he's barely able to control his mind and body, you'll be right there with him. So anyway, it's unabashedly, mindlessly pro-Queen, which is no surprise. To get there, the screenwriters (when the musical chairs of this film's tortured path through Development Hell ended, Anthony McCarten ended up with the final credit) have cobbled together a profoundly superficial tour of the band's lifespan from 1970, when Farrokh "Freddie" Bulsara elbowed his way into a dying college band consisting of guitarist May (Gwilym Lee) and drummer Taylor (Ben Hardy), with the later introduction of bass player Deacon (Joseph Mazello) all the way to 1985, when Freddie's AIDS diagnosis shocked him into abandoning the free-for-all life of tastefully off-screen gay orgies that had kept him away from the rest of Queen for years, in time to reunite the group for a legendary televised performance at the Live Aid charity concert. Those of you with a working knowledge of Queen's history will notice at least two factual errors in that précis, and not little ones either, but a little bit of factual fudging is no harm in service to a more interesting dramatic story. The problem is that the story generated by e.g. relocating Mercury's diagnosis by two years is so hellaciously focused on the Rise and Fall and Rise of Queen, considered purely as a music-making object that had to deal with occasional difficulties in the personal life of its frontman and aesthetic leader, rather than a dramatic story of humans. That's not, like, an impossible choice to make work, but it probably needs a more heightened level of aesthetic stylisation than director Bryan Singer is interested in or capable of bringing to the proceedings (the most interesting thing about the direction is that a gay filmmaker in 2018 would or could make a film so exceedingly alarmed by homosexuality). It also still needed a better screenplay than this one, which barely even functions as a biopic of Queen, let alone as a biopic of its members. The film proceeds from the 1970 meeting of Mercury, May, and Taylor to the 1975 recording of the album A Night at the Opera and the single "Bohemian Rhapsody" with virtually no interest in anything whatsoever that transpired between "we should record an album" and "we are hitmakers"; the years from '75 to '85 are a bit more fleshed-out, largely because of the film's bug-eyed fascination with Mercury's embrace of his sexual appetites and the negative impact it had on... something. The conflict seems to be less that Queen hit a rough patch that, historically, didn't really take place (certainly not the way the film insists it did), and more than May, Taylor, and Deacon remain irritated by Mercury's tabloid-fodder behavior in the first half of the '80s, and have seen fit to make his fictive analogue apologise to them three decades after the fact. The result of all this is little more than a collection of sequences built around the performance of Queen songs, occasionally with some mediocre attempts to contextualise those songs. "Bohemian Rhapsody" is the only time this works; the parodic montage of critics' responses lambasting the piece as indulgent, bland, and sloppy is the only time the film evidences any particularly worthwhile sense of humor. Otherwise, it's mostly stuff like "did you know that 'We Will Rock You' was a hit? What about 'Killer Queen'? Isn't it kinda weird that the guy who sang 'Who Wants to Live Forever' would die at age 45? "† and all sorts of other twaddle that teaches us nothing really about how the songs were made, or what if anything makes them interesting. Thus does a film that stretches on for 135 whole minutes have more or less no kind of plot momentum, no sort of an arc until a rather long-ish re-creation of most of the Live Aid (in front of one of the very worst CGI crowds I can remember) set retroactively gives it one, no clear chronology, no character evolution in particular - Freddie is crudely moved from one phase of the plot to the next; the other three band members exist as nothing more than a sounding board for Freddie's amazing ideas and shocked, upset faces when he's the worse for drugs (the film's Queen evidences a highly non-'70s virginal sobriety that would have seemed excessive for the Osmonds); I can't even bring myself to talk about poor Lucy Boynton, utterly stranded in the role of Freddie's wife Mary Austin, a deeply thankless role even by "wife in a music biopic" standards. It has, in fact, only two things. One of these is John Ottman's editing, which at least plays around with rhythm on the micro level - there are some fun split screens, punchy cutting around songs, and the "Bohemian Rhapsody" recording captures something of the escalating joyful frenzy of making music. The other is Malek, who is pure rock star ebullience as someone close enough the real-life Mercury that you can pretend. If the film actually has any of the energy that purports to be the purpose of any of this, it's do largely to Malek's happily campy line readings and big physical gestures - note that I say "if", but at least it mean the film isn't a complete washout, even it is not remotely enough for it to become any active, pleasurable fun. *Well, not all of mine, anyway. "Crazy Little Thing Called Love" fails to put in even so much as a cameo, and it turns out that when you only include as much of "Under Pressure" as the late David Bowie's lawyers will permit you to include, it totals about 20 seconds. †I mean, not...really? It was actually Brian May who wrote it, as part of the soundtrack to Highlander, a movie about a tragic immortal, and Mercury hadn't been diagnosed with AIDS yet, but I suppose I understand what the film thought it was getting at.